here is the new resource of flex tutorials. it has great tutorials. Juan is serving greate services to flex community. As I seen till date very less developer and designer are contributing for UI and usability source except Juan (As per my knowledge). I like the way Juan is promoting UI designer community and serving good design resource. As an individual contribution I also create vista theme for community use. 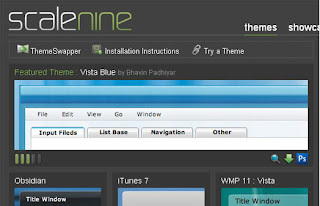 I given the same theme to Jaun and he had made available this theme on www.scalenine.com . I am planning to create very new theme based on current user test. Please keep watching www.scalenine.com.